If you want to stand out this Christmas, it might be no better way than sending your friends and relatives some humorous holiday cards. There’s a lot out there to choose from, and they cover virtually all types of humor, from safe and family friendly to risque so that you can match them to the appropriate person. Picking the right ones is always great fun as it entails looking through jokes for a couple of hours, but if you’re short on time, here’s our selection. This is basically a pack of 12 cards that you will receive together with the appropriate envelopes, sized at 5 x 7 inches. You can choose from 10 different funny images, all of them drawn in a classic newspaper comic style but varying quite a lot in the type of humor employed. We found them pretty easy to get, so they should be accessible to a wide range of people, while the more puritan of your friends could find some of them in bad taste. The build quality of the pack is reported to be good, printed on glossy paper with vibrant colors. 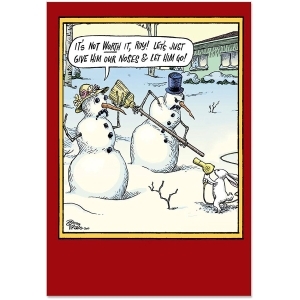 A variation on the classic “snowman threatened with a hairdryer” joke, this comic places a rabbit in the position of the armed aggressor, apparently in the process of holding up Mr. and Ms. Frosty for their carrot noses. We found it pretty innocent and imaginative without being in any way corny and it comes on glossy 5 x 7 inches paper, with good printing and fine coloring. You can buy this card in packs of 10, 12, and 36, depending on the number of acquaintances you have, since the content is really fit for all ages and inclinations. 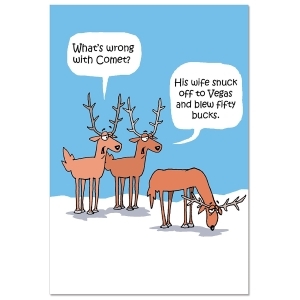 You might want to be a little more selective in who you send this NobleWorks card to, as it features a rather dirty joke involving Santa’s reindeer. It’s basically a pun on the multiple meanings of the words “buck” and “to blow” that we’ll let you make out for yourselves, in case that short sentence didn’t make it clear enough. Like with most NobleWorks products you’ll have two sizes to choose from for the format, meaning 5 x 7 inches and a “jumbo” 8.5 x 11 inches (very close to an A4) and a different number of units for each pack, 10, 12, or 36. 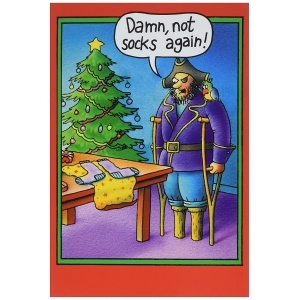 This one makes fun of the unimaginative or uninvolved choices we make when it comes to gifts by using the character of a peg-legged pirate who keeps receiving socks for Christmas. Although we’re not the Broadcast Standard and Practices, it’s safe to say that this is an innocent enough joke, and can be sent even to friends that are missing a limb, together with your best wishes and a “Merry Christmas mate” printed on the inside. The print enjoys the same level of quality as other NobleWorks products, and it is US-made, with a clear specification from the manufacturer that it wasn’t printed in China. 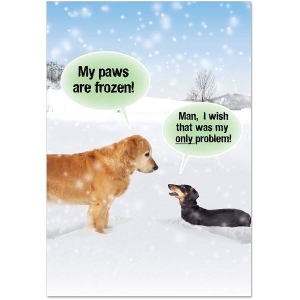 This one might be better suited for a dog lover since it features a doggy joke between a golden retriever and a dachshund. It’s a photoshopped picture, not a drawing, as the two animals are expressive enough not to require sketching. Other than that, it comes from NobleWorks, the New Jersey manufacturer of holiday greeting cards and it can be acquired under a number of sizes and units per package, including an 8.5 x 11 inches version. Another thing to note is that NobleWorks uses eco-friendly, easy to recycle paper, so you shouldn’t feel guilty for using their products in large number. Christmas is a great occasion for reconnecting with your family and for sending a message of peace and good will to anyone you know. Christmas cards are the best method to convey your message during this time of the year, but you need to make sure that yours do not just get lost in the waves and waves of cards everyone sends. If you want your Christmas cards to make an impression, you need to go for something that spells creativity right from the get go. With so many cool Christmas card designs available around, you may feel a bit overwhelmed, though, and that might just put a damper on your excitement that the holidays are approaching. You can choose just a type of card to send out or several. No matter your approach, you need to make sure that you will have everyone who got a card for you to remember it and even mention it when you get back to work after the holidays. Companies always take sending greetings to their employees very seriously, and the cards they send have a certain quality and a carefully selected message. Even if you just want to send out cards to people you know, you may still want to make a great impression, which is why this buying guide will help you. Digital Christmas cards are very convenient, and they will surely save you a lot of time, by being able to just send all the greetings you want with just the touch of a button. However, digital cards may not be able to tell how much you care about someone if they imagine you doing exactly that. They may just think that you didn’t care to put a bit of extra effort into wishing them a “Merry Christmas”. While it may be acceptable for companies to send out digital greeting cards to their business partners, since they don’t want their cards to get lost in the mail, as an individual, this is a risk you should be willing to take. Choose the greetings cards from the many available for sale, and put them in good old fashioned envelope on which you write the address. Don’t forget to complete your address on the back, as well, in case your recipient would like to send a thank you not, or even a card as a reply. Even if our world is almost entirely digitalized, this doesn’t mean that you should overlook the proper etiquette for such occasions. 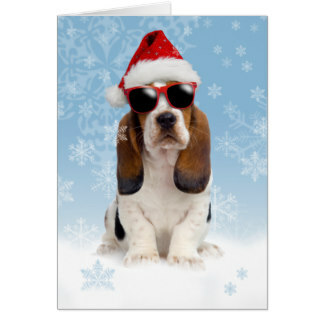 There are many cool Christmas cards displayed online, on various websites, that just need to be downloaded and printed. So you can save money this way, as long as the design you choose is something you find appropriate and even unique. However, for the best impression, purchase some great looking Christmas cards and send them to the people you want to impress this holiday season. When choosing the kind of card you want to send, be considerate of your recipient. Not everyone celebrates Christmas, so, in case the people you want to send greetings to are part of this category, you should stay on the safe side and pick something that says something related to the holidays in general, instead of the traditional “Merry Christmas”. Generic cards with holiday greetings can be found everywhere, so you will be hard pressed not to find something suitable for the person you want to greet on this particular occasion. Aim for cards that say “Happy Holidays” or just “Season’s Greetings”, as you will not be able to go wrong with these. Also, if you are in doubt, and you don’t know for sure whether they celebrate Christmas or not, choose a safer option. 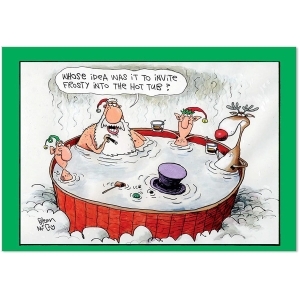 It is best to have a bunch of Christmas cards purchased before the stores get very crowded. Pick a model for those who celebrate Christmas and would prefer the traditional “Merry Christmas”, and another model for those who don’t. This way, you will be covered for all situations. 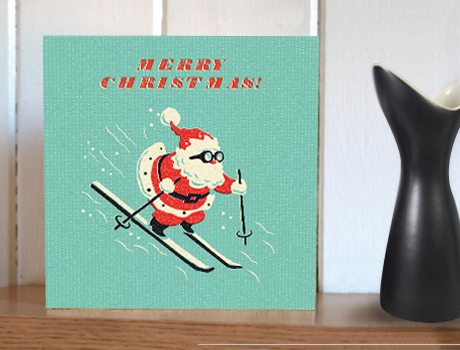 Don’t forget that what makes this occasion special are simple Christmas card greetings. You do not have to be especially unique in what you are saying on each card, but a nice touch would be to write down by hand a small note on each card. Personalizing your greetings will make your message stand out. Most people just send the same message and people can be disappointed when they receive this type of holiday greeting card. If you do not want to be part of the large mass of individuals who send cookie cutter messages, consider taking a bit of your time to write a few words that are intended for the recipient’s eyes only. It is considered classy to send hand written notes on special occasions. Use this upcoming holiday season to make a great impression on everyone you know, by sending them personalized cards that include such messages. When you are picking cool Christmas cards, don’t forget about the importance of a beautiful layout. The overall layout should be neat and nice, and the colors picked should spell good taste. There is always a risk of making your message look as tacky as the cards you are sending. Do not risk this happening to you, by carefully choosing the proper design for your cards. Don’t be afraid to spend a little more this holiday season. If you pick cheap looking cards, it will show. Especially if you are planning on making a good impression on your recipients, it serves to splurge a little and get good quality cards that demonstrate that you took the time, the effort, and yes, even the money, to send a greetings card that says how much you care. While you should not break the bank to get expensive Christmas cards, you can afford, just this time to show off a bit and send the right message along with the right card.